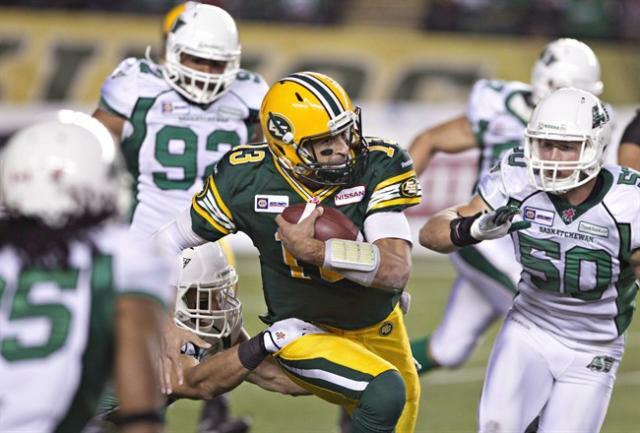 When the CFL added a ninth franchise this season, expectations were high. The fledgling Ottawa RedBlacks had hopes of making the playoffs in their inaugural season and the league and TSN were expecting improved television ratings. After all, the addition of another city usually brings with it some fans and viewers. There's also usually a buzz generated around a new entry -- even one that has the strangest name in all sports. But things didn't work out for either the RedBlacks or TSN. Possibly diluted by expansion, possibly affected by a change in player ratios, the CFL turned in its lowest-scoring season in decades. In addition, the fact that half the league (that portion east of the Manitoba border) couldn't crack the .500 barrier made for less than compelling competition. So it really shouldn't be a surprise that CFL ratings are down this season. What might be the surprise is that they're down only 6 per cent. According to TSN, CFL games averaged 660,000 viewers this season. While lower than last year and lower than expected back in the spring, the CFL is still the most-watched summer sport in Canada. By comparison, Toronto Blue Jays games averaged 580,000 as the team flirted with making its first playoff appearance in 20 years. The drop in attendance shouldn't create any panic, either at league headquarters or in the TSN executive suites. Whatever caused all those low-scoring games should be fixed by next season and despite the yawn-inducing nature of too many games this year, ratings are still strong compared with the competition. Saturday's season-ending game between Edmonton and Saskatchewan just missed the one-million mark and was topped only by hockey. In fact, that game did better than the Hockey Night In Canada late broadcast featuring the Vancouver Canucks -- no easy feat. Nobody likes to see ratings drop, but whoever takes over the CFL's top job will go to work knowing he (or she) has a strong TV product. What's hot: Is that the Toronto Raptors drawing big audiences and winning all those games? The first-place Raptors attracted well over 200,000 viewers for two games on the weekend, impressive considering one was on Sportsnet One and the other went up against the NFL on Sunday. If the team stays hot, this could be the breakthrough the NBA has been hoping for. What's not: While Sunday's NHL game on City broke the million mark, thanks to the Leafs and Senators being involved, the much-touted pre-game show is still lagging badly. No wonder Ron MacLean is looking a little down these days: he's preaching to about one-third the number of people he used to on the Hockey Night In Canada pre-game show. Things may pick up when the football season ends, but this hometown hockey thing has gotten off to a pretty slow start. For footy fetishists: If you like soccer, your weekend is pretty much booked. The UEFA European qualifiers go this weekend with games starting at noon ET Friday through Sunday. Rogers and its various and sundry channels will have all the action.